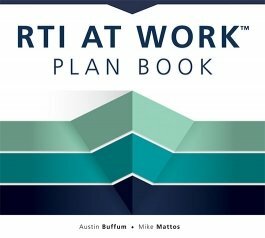 Create a path to success for every student with the support of our RTI at Work™ Plan Book by experts Austin Buffum and Mike Mattos. Broken down into 40 weekly planning pages, the plan book helps individuals and collaborative teams stay on top of various responsibilities, tasks, and goals as they implement a three-tiered approach to effective intervention. Also included are reproducibles, tools, and activities designed to improve teamwork and strengthen daily practice. Review the foundational ideas and basic concepts of RTI education and the RTI at Work process. Recognize the positive cultural shifts that occur in schools by implementing response to intervention (RTI) within a professional learning community (PLC). Learn best practices for using the forms and reproducibles included in the book to meet daily RTI goals. Read inspiring RTI at Work success stories from real teachers and principals. Acquire references and resources for further study of RTI at Work and PLC at Work®.